The Puretec Whole House system is the number one choice for an overall solution to clean water for every purpose. Whether you need clean water for showering, filtered drinking water, or just want to protect your ceramic disc taps at an affordable price, then this filter is the perfect option. The Puretec WH2 Series systems are designed for the budget-conscious householder, giving good general purpose filtration. These systems do not require power to operate. Very easy to maintain, just replace the filter cartridge when the taste and odour returns or every 6 months. 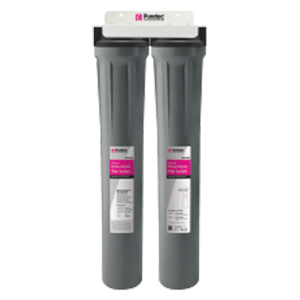 The Puretec WH2 incorporates Puretec’s long life filter technology, so you can go longerbetween filter replacements, and comes with our 10 Year Platinum Protection Warranty^.